As some of you might know, I work for a plant conservation charity, Plant Heritage, which manages over 640 National Collections of plants, or, as we like to call them, “living plant libraries“. Some are collections of popular ornamentals such as tulips or yellow daisies, some hold incredibly rare species brought back by adventurous plant hunters in the 19th century, and some display uncommon plants like carnivores or exotic orchids. Working with these people is a fantastic journey into the plant world. They are not!!! And this is why I can still be amazed by the plants growing on the car park of the office…Very uninspiring at first sight, isn’t it? Bu get down on your knees and you will see a great diversity of plants thriving on this boring gravel patch. 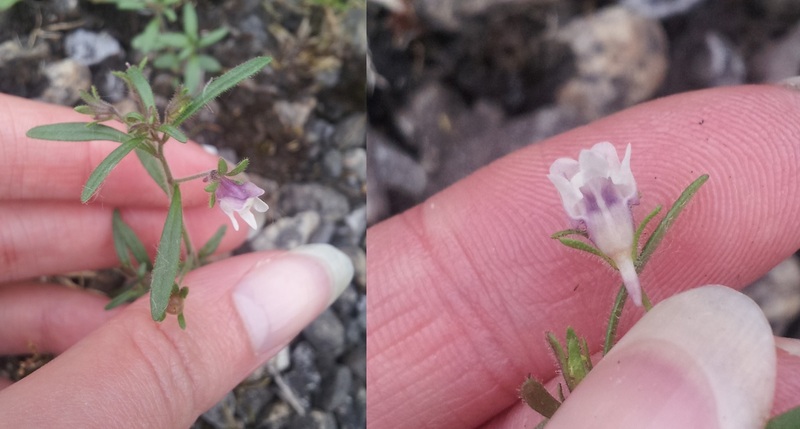 First, a complete novelty for me : Chaenorhinum minus, or Small Toadflax. 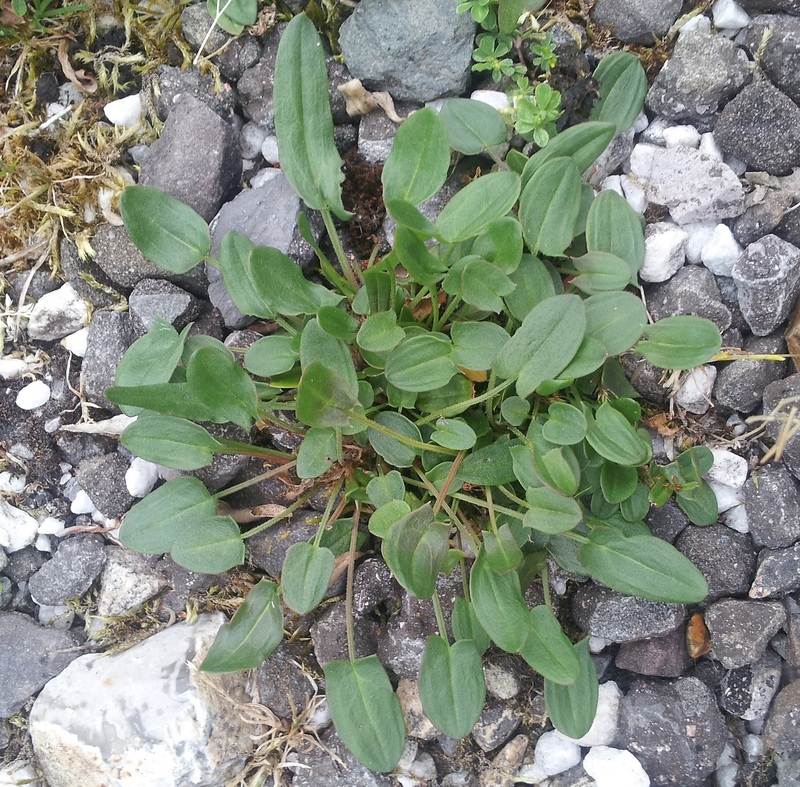 This is an archaeophyte, a non-native plant which has become naturalized before 1500 A.D (its original distribution range includes Southern Europe and Turkey). 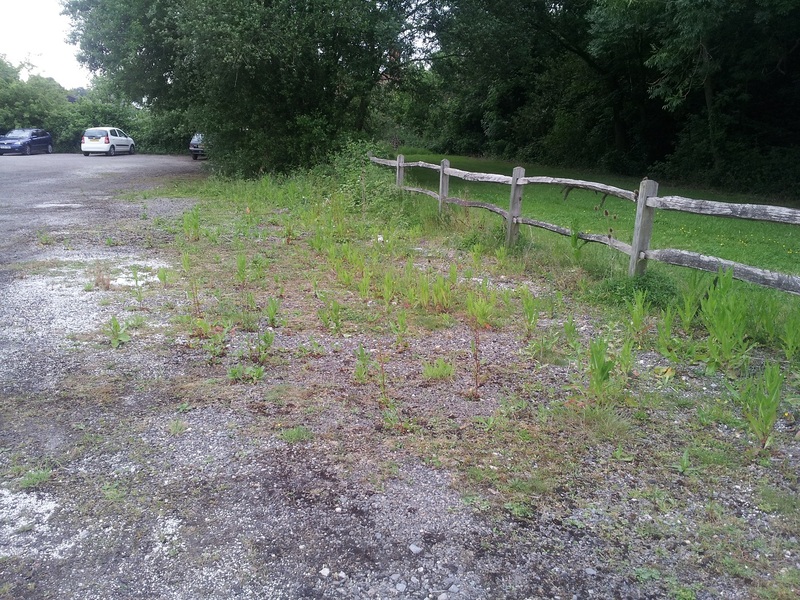 Dry gravel on a car park is an unfriendly place to grow, with a presumably poor soil quality, so many plants show adaptations to that environment. 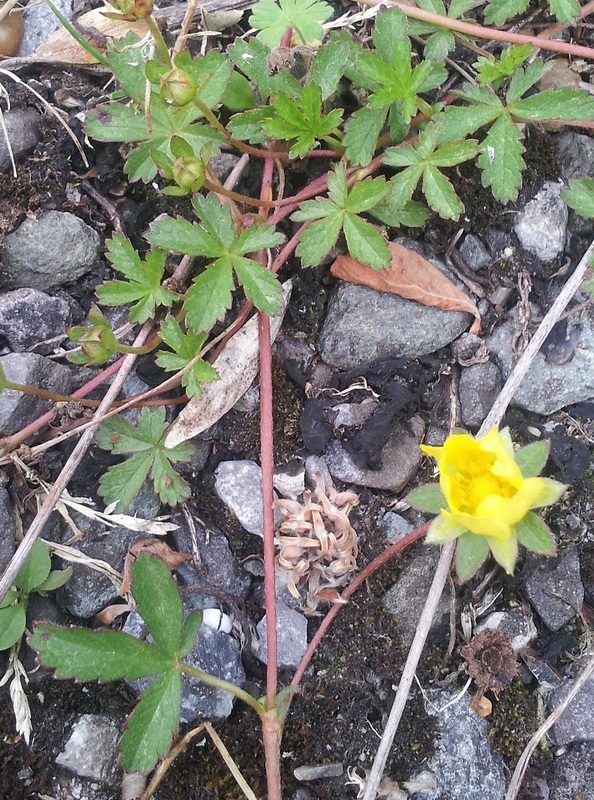 Often they will grow smaller than normal, like this miniature Trifolium dubium (Lesser Trefoil, usually 5-15 cm high, this one is only 2-3 cm high!) 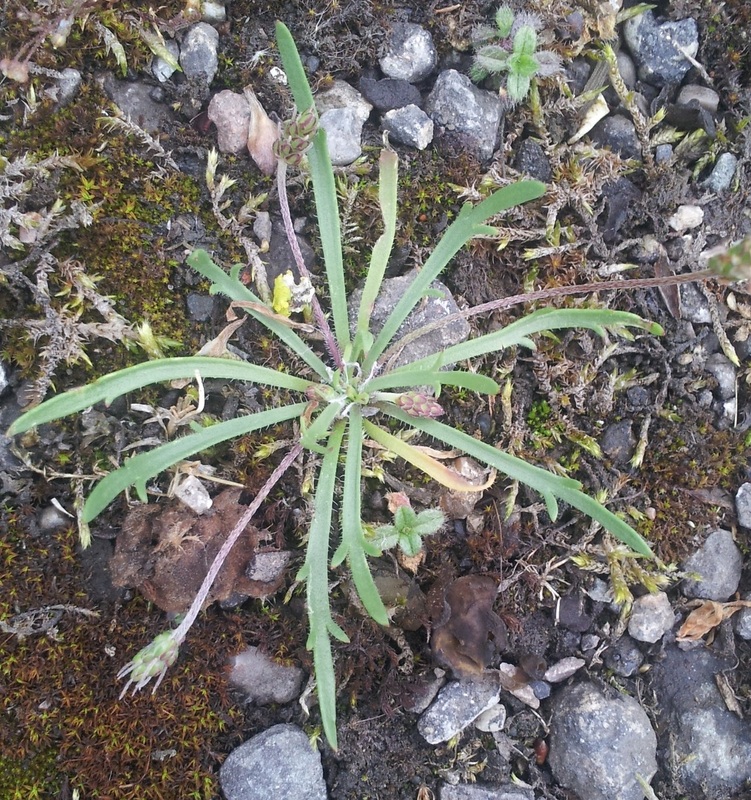 or have fleshy leaves to retain water (here, Rumex acetosa with bizarre, rounded leaves). Two species of plantains (not the banana!) 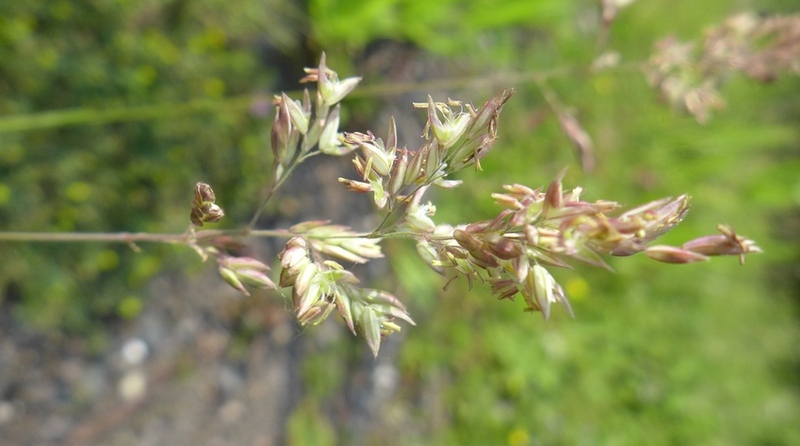 : the Greater Plantain (Plantago major), a common sighting of grassy roadsides, and a less common one, Buck’s-horn Plantain (Plantago coronopus). 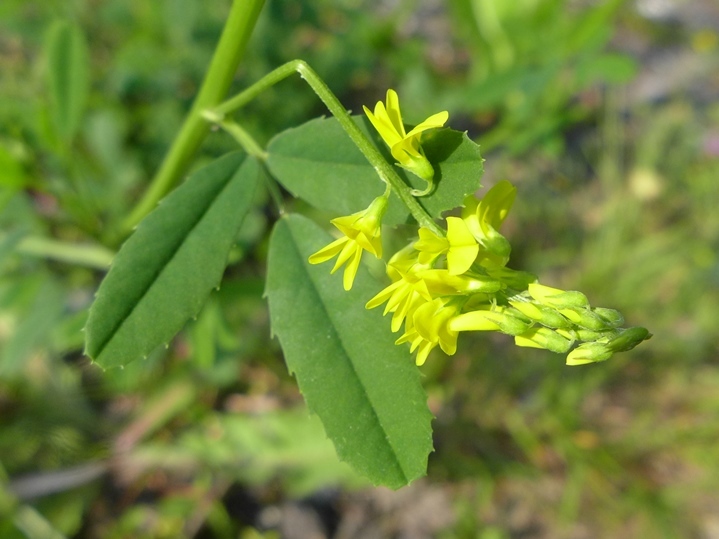 The latter was initially thought to be a purely coastal species, but it is now found in sandy places inland. 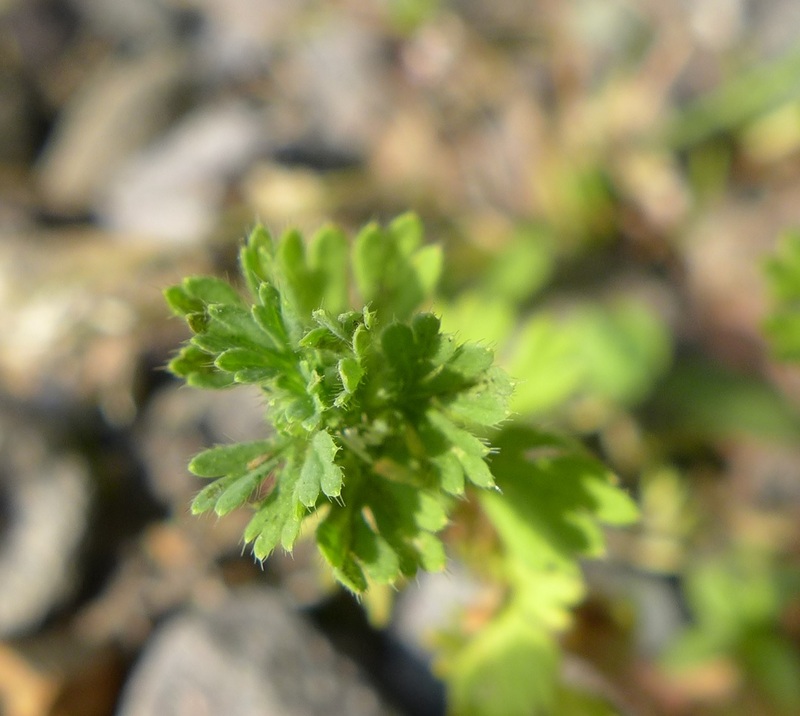 Plants in the Geranium family can easily be recognized by their lance-shaped fruits, which split in 5 parts when dry. 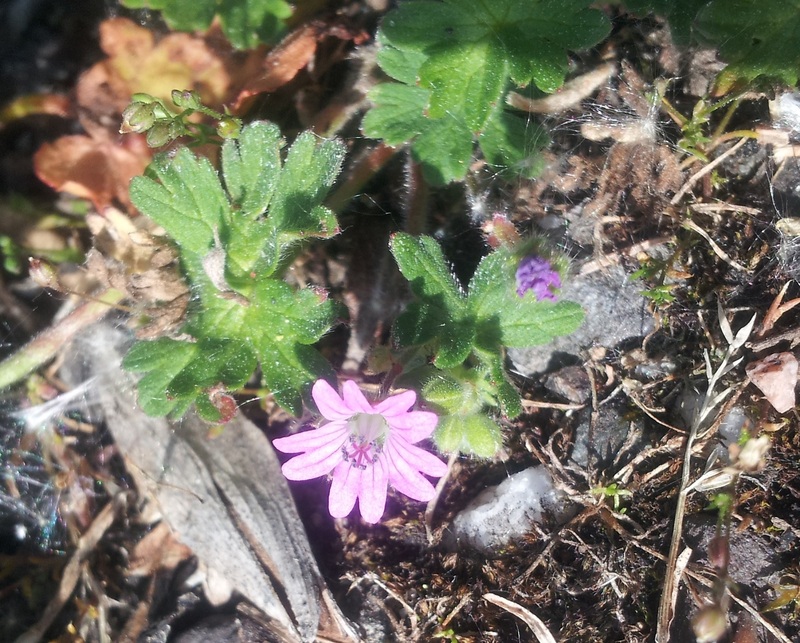 Two members here : a Common Stork’s-bill (Erodium cicutarium), typical of dry, stony places ; and the Dovesfoot Cranesbill (Geranium molle). 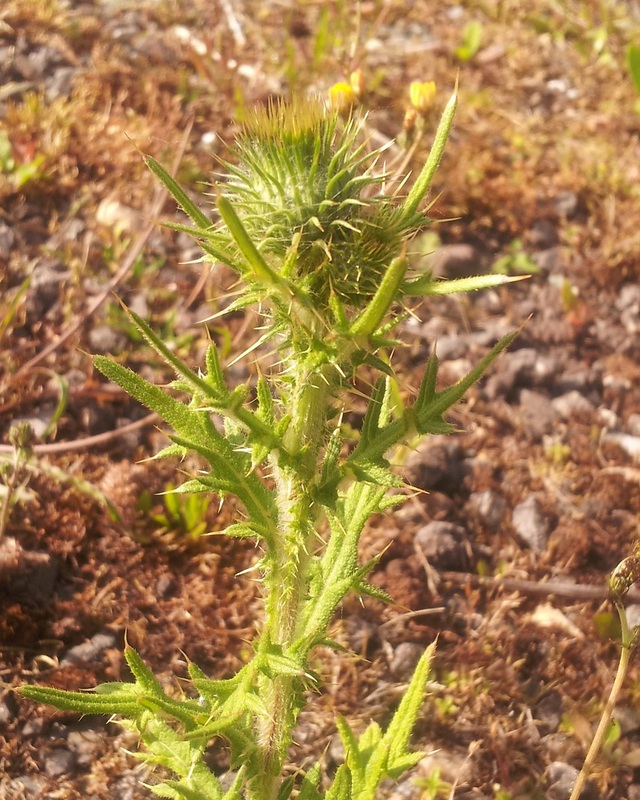 Two “thistles” which belong to completely different families : the first one is a true thistle, the Spear Thistle (Cirsium vulgare) with its characteristic nasty spines ; while the second one is a Teasel (Dipsacus fullonum). 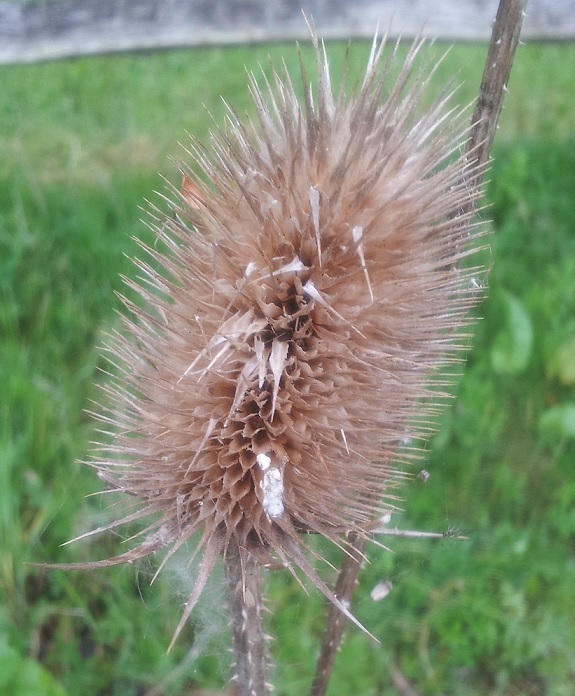 Dead flower stems are persistent in teasels (this is one of last year’s) and some seeds are still released during winter, which provides a fantastic food source for birds. Sometimes “unexpected” plants can also be observed : both Lamium album (White Dead Nettle) and Downy Birch (Betula pubescens) should be found on richer and moister soils! But most of the plants growing there are typical of dry, rocky, infertile places like waste grounds, railway banks, roadsides….or car parks, like the Field forget-me-not (Myosotis arvensis) with its pretty blue flowers. The Petty (not pretty!) 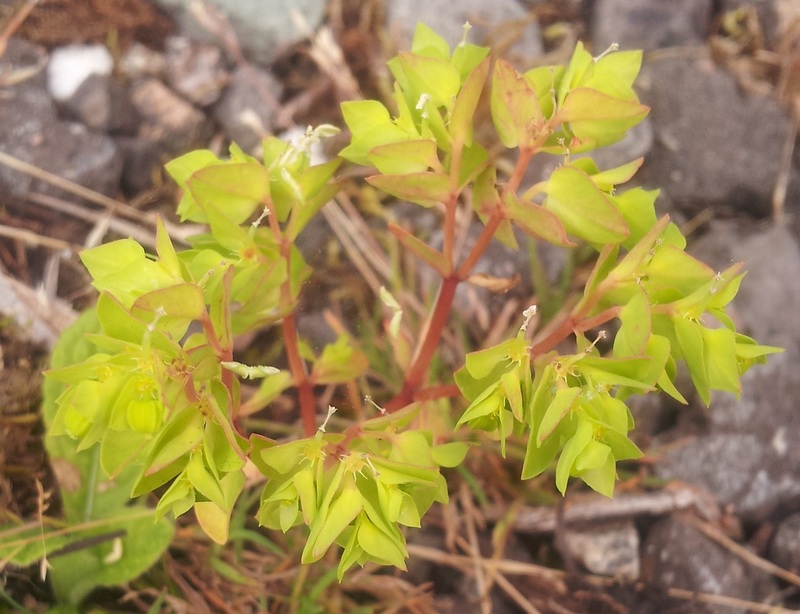 Spurge (Euphorbia peplus) is an innocent-looking and common garden weed…which contains powerful anti-cancer components. Plants just won’t cease to amaze me! 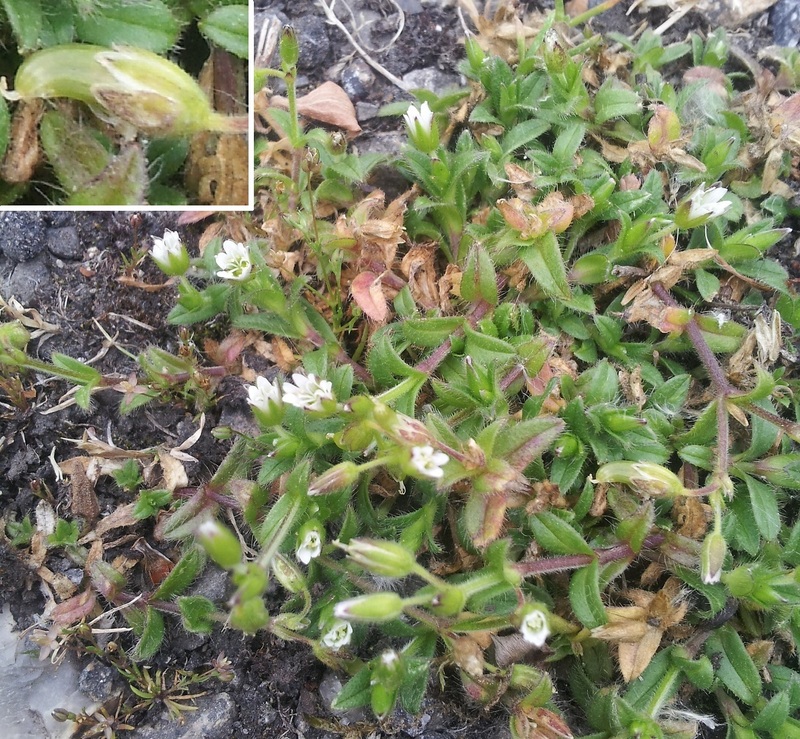 Two creepers next : the common mouse-ear (Cerastium fontanum) with strange banana-shaped fruits, and the Creeping Cinquefoil (Potentilla reptans), which spreads by using vigorous stolons and can grow up to 2 meters every year…nasty one! Two plants that I’m always happy finding (botanist’s treats? :D) : the Parsley Piert (Aphanes arvensis) ; and the Ribbed Melilot (Melilotus officinalis), with sweet-scented pea-like flowers. As the name states (meaning “honey lotus” in greek), it is melliferous, so this is a very useful, insect-friendly plant. Not all grasses grow in dense, humid meadows. Here are the Annual Meadow-grass (Poa annua, a sturdy species which tolerates mowing, grazing and probably cars passing !) and the Yorkshire Fog (Holcus lanatus), an easy-to-recognize plant thanks to its greyish, velvety leaves. Is it particularly common in Yorkshire? Not really, “fogg” is apparently an old Norse word for “grass”, and “fog” an old English word for a “meadow with coarse grass”. Fascinating to see how these plant names arise! Unsurprisingly, disturbed and unfriendly places are a favorite spot for native or non-native invasive species and weeds. 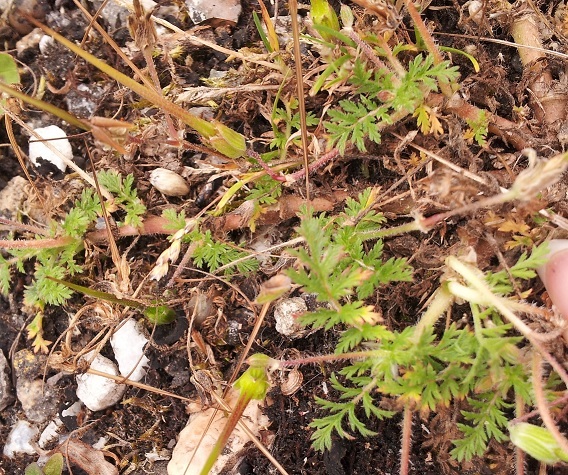 The first one, ragwort (Senecio jacobaea, unmistakable, even in leaves only) is actually native to the UK, but it has spread widely and is considered as a nuisance because it is extremely toxic to grazing animals. The second one, an Oenothera (or evening primrose, as they tend to bloom in the evening) was introduced to the UK in the 17th century from North America. The genus is a nightmare for botanists because they hybridize very easily, and because the number of chromosomes, which is usually a reliable feature to identify plant, is variable within a species…so I won’t risk an ID for this one! Dry gravel can be a nice habitat for warm-loving animals and insects in colder days, as the rocks will retain heat longer than normal soil, but they can also be a hellish place on hot days, as the temperature can climb to dangerous levels. In just a few minutes, I observed bumblebees, a common lizard, but also a discrete Field Grasshopper (Chorthippus brunneus) and a familiar but still lovely butterfly, the Peacock (Inachis io). What a great post. It just goes to show you that being able to ID plants makes your life better. A great post – don’t overlook what is under your feet (or even tyres). 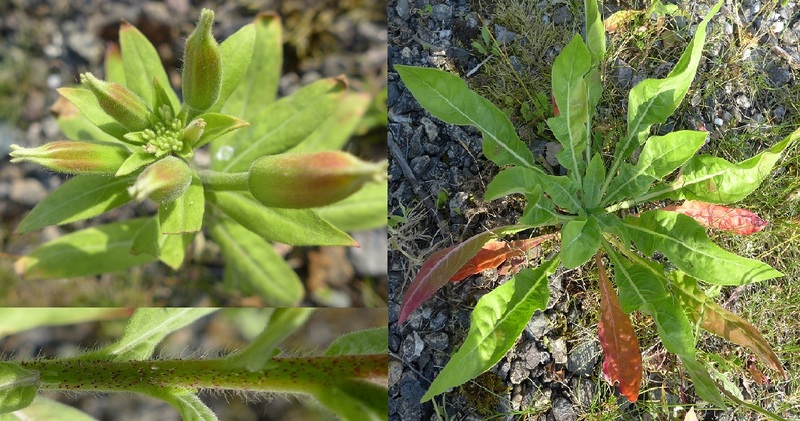 Of the species you mention, has anybody else noticed a huge increase in Euphorbia peplus this year? It seems to be in every path I look at. Thanks for your kind comment. I can’t really compare as I’ve only been in the UK for a year, but I’ve certainly seen a lot in Surrey (and on all sorts of soils and exposures). 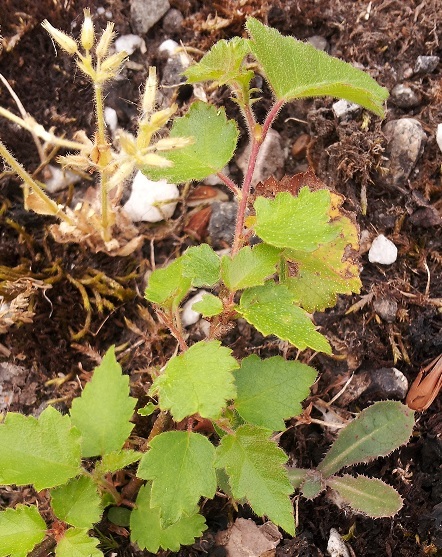 It’s quite an opportunistic plant, so it might have taken advantage of the sudden warmth in end Spring/early Summer. Hi Sophie! It’s been a long time since that GCN course, n’est-ce pas? Speaking of Peacock butterflies, there’s a great number of Peacock butterfly caterpillars on nettles in Morden Hall Park at the moment. 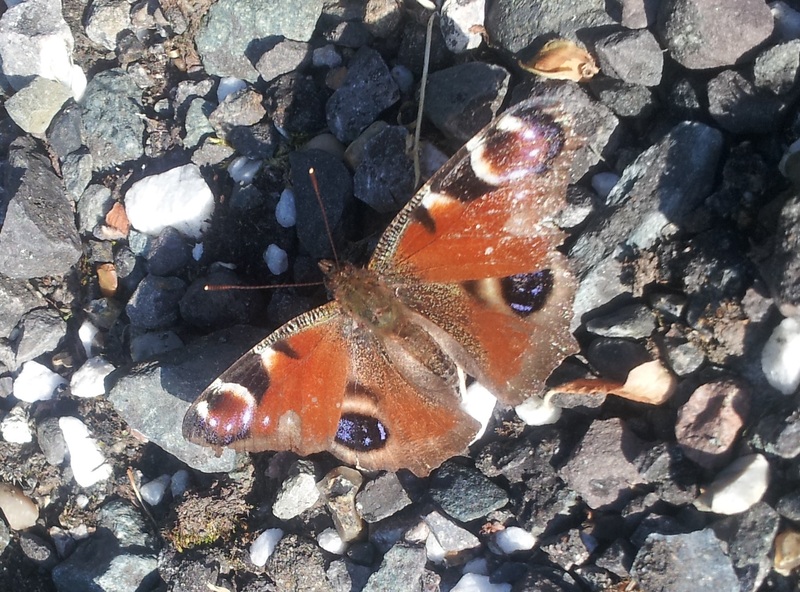 I hope to see many of them flitting about later on so I can count them on my butterfly survey! Great post, as always. Noticing plants everywhere, now that’s the mark of a true botanist! Lovely idea for a post. I shall be scrutinising our own gravelly parking area carefully! I didn’t know the word archaeophyte – ta. Thank you 🙂 I like discovering plants in common and unexpected places!